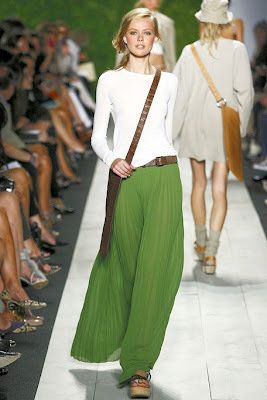 A new arrival into our wardrobes, maxi skirts took hold of our fashion thoughts in 2010 and have continued to make their way into our standard weekend wear. An absolute essential. What is fantastic is that the more they are around, the more they become acceptable for any occasion - I've spotted a few in some pretty plush places in London, as well as airport terminals (they are super comfy long haul flight wear), holidays and weekend drinks. Zara - try this long, pleated black maxi for a quick fix you can wear anywhere for £29.99 here. American Apparel - always good for pieces like this, take your pick of colour for £40 here. ASOS - these guys can't do wrong for simple capsule pieces, this white number is fab for £30 here. Coast - Coast aren't just for bridesmaid dresses, they make great skirts too. This one is £95 here. See by Chloe - Much more expensive, but because it's MUCH nicer. £270 here. Maxi skirts are definitely still in trend. I don't own one yet, but I will consider about it for spring. Looks amazing. Maxi skirts are always in trend, can't have enough of them! Love your blog! I've been finding the maxi skirt helpful with maternity wear, and I need more! just got a maxi exactly like that last one and have worn it twice in a week - I feel like it'll take me right through to summer and yes, I want another one already - it just feels good to wear!